This Stamping Technique Called Black Magic, Gives You Fabulous Results For Comparatively Little Effort. When I first saw the Black Magic Stamping Technique, I was really impressed with the graphic strength obtained, so I did a little research and tried it for myself. Yesterday I had a workshop and demonstrated this technique. The whole group, which included 3 generations of the one family enjoyed the relaxing activity of using the water-colour pencils, (just like colouring in when we were little). As usual every card turned out differently. I really wish I'd taken my camera - the cards produced were very impressive. I was pleased to finally find something where I loved using the Fabulous Flowers stamp set, and it was great to be able to show the group how different rubber stamping techniques work really well with different stamp sets. Here is the sample I made for the group. Each of the workshop guests could choose their own colour scheme from the Stampin Up Watercolour Pencils and we ended up with Purples, Teals, Yellows and Blues - they all looked great, and each persons colouring technique was individual. I did suggest that they use 2 harmonious colours just so they could achieve a little dimensional variation in each petal. The detail photo shows a bit of my colouring technique, and also the little trick of highlighting the tips of the petals with the white gel pen to create a strong and vibrant contrast against the black card stock. Here is a quick overview of the technique and the products needed. Ink large flower stamp with whisper white and print onto black card. Allow to dry or hasten drying with the heat tool. 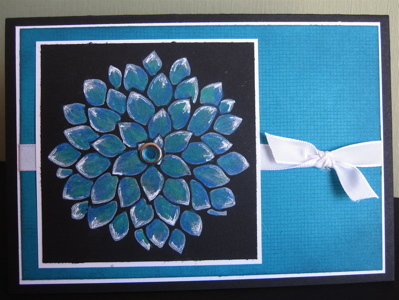 Ink Canvas background stamp with Taken with Teal and print onto Teal backing card. Choose 2 harmonious colours and colour in petals leaving a little white showing through here and there. Highlight the tips of each petal with white gel pen. 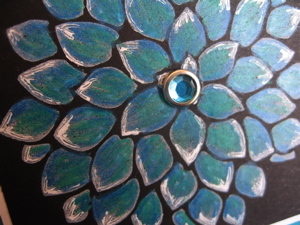 Insert large Rhinestone brad in to the centre of the flower. Matt the black card onto white. Tie Ribbon around Teal background card, then matt onto white. This is a really quick technique once the white ink is dry. I actually pre-printed the flowers for this workshop as I had loaned my heat tool to one of my new down-lines, and I didn't want to risk the ink not being totally dry. It is so easy to print up 10 or 15 of these at one time and then you have a lovely stash for any time you fell like doing some relaxing colouring. If you would like further information on this technique, or you would like to book a workshop contact me using this form, and I will answer your questions. You do not have to be really experienced at stamping - We had a great grandma doing her first workshop with this one, and her card turned out beautifully. You may like to browse our on-line Idea Book and Catalogue, to see all the wonderful, industry leading stamp sets and accessories that Stampin Up has to offer. You can order via my web-site if you do not wish to host a workshop, but it is so much fun learning the techniques from a trained demonstrator and I can tailor a workshop just for you.